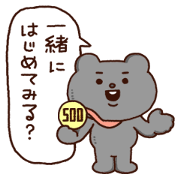 Betakkuma teams up with One-Coin Investment for a special sticker collaboration. Join this bear in all of its fun financial adventures! Friend the LINE Smart Invest official account to get the set for free.